I am sharing some more of our backyard blooms and birds. I am sad to say we lost our Weeping Cherry tree in our backyard. We have not removed it just yet, the birds love to sit in the tree waiting to take their turns at the feeders. Above the Scarlet Tanagers were seen with a group of Waxwings by our mailbox. 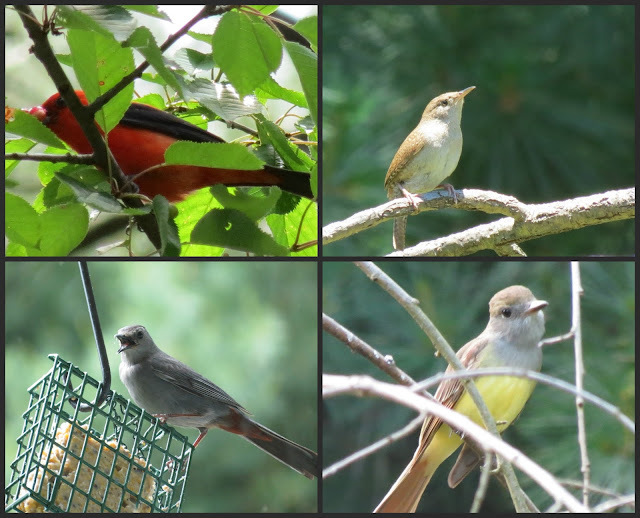 They were eating berries in one of the trees, a House Wren in the Weeping Cherry tree, A Catbird on the suet feeder and the Great-crested Flycatcher in the Weeping Cherry tree. The Daylilies are starting to bloom next to our driveway and in the yard. These look like the same daylilies we see growing wild along the roads. 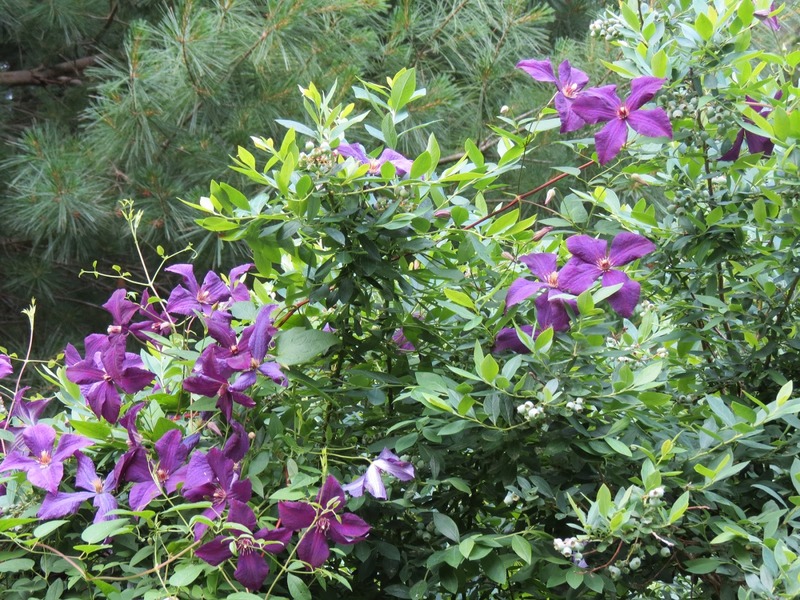 The Jackmanii Clematis has taken off, growing well also near the Blueberry bushes. This Clematis has been blooming for awhile, one of my favorites. This Spirea bush has grown large over the years, it is starting to mix with our blueberry bushes. The Stella D'oro lilies are also blooming nicely. For Tom's Barn Collective this is a local barn we pass by often. It seems like the owners have done a lot of work on it lately. Happy 4th of July! 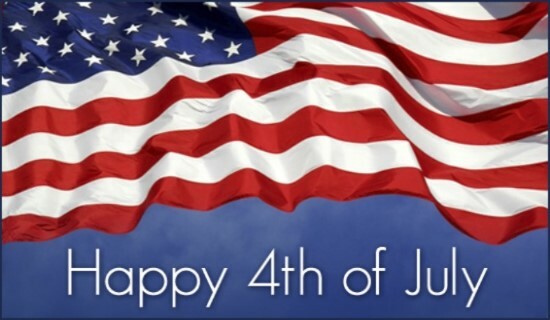 Wishing everyone a safe and happy 4th of July. Have you enjoyed the birds and blooms? I hope so! Thank you for visiting and for the nice comments. As always, thanks to the wonderful group of hosts listed below. What a lovely collection of birds and floral delights, topped of with a wonderful red barn. Thanks for joining The Barn Collection Eileen, enjoy your 4th and hurry back. Beautiful birds and blooms. Hope you have a wonderful holiday! Eileen-you have a lot of beautiful blooms. It has been such a good year for Clematis, hasn't it? Helloo, Beautiful pics, Thanks for the post. Gorgeous birds and blooms, as always, dear Eileen! Happy 4th of July to you!!!! Such beautiful flowers! Have a great 4th! Your garden is abundant with beauty, both in birds and flowers! Happy 4th, tomorrow! Have a wonderful day! The day lillies are gorgeous! I'm grateful for bloggers for many reasons, but from ones like you, I've learned so much about species of birds. We have a feeder now and I really pay attention to the customers! Gone are the day when I just lumped them all into one category: "birds!" Thank you! 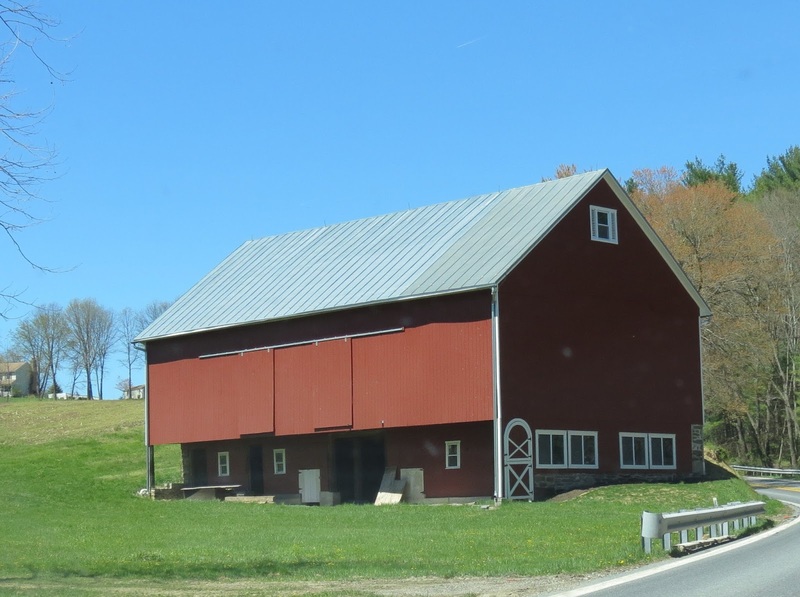 Another great series of birds, blooms, and barns! :-) I love the Scarlet Tanager, and am really missing my clematis this year that died, yours is lovely! I hope you're having a great 4th weekend - Isn't it crazy that it's July already?? pretty blooms and a grand barn. Lovely flowers! Happy 4th of July! Happy July 4th! Beautiful birds and blossoms! Nice set of pictures - give me birds and flowers over flags any day! Lindo um belo trabalho com magnificas fotografias. Happy 4th July. Your garden blooms are beautiful. Love the Daylilies and clementis. the flowers are just gorgesous. sorry to hear about the tree.. maybe you can keep it for the birds. our neighbor had a citrus tree that died and it was gorgeous as a piece of art, like a large driftwood art... it was there for many years and then thye took it down and i was so sad..
Beautiful images you have given us. Great images from your backyard, Eileen! What a beautiful variety of birds and blooms. That scarlet tanager is amazing, I would love to see one of those. Happy $th of July to you and your family Eileen!! I always enjoy your firsts and photos of flowers and the world around us!! Such beautiful birds and blooms on your post today, Eileen! You are fortunate to be surrounded by such beauty in your own yard. Happy 4th of July and have a great week ahead! first congratulations to the Independence Day ! Marvelous photos of the wonderful flowers and all the birds around you. Have a nice new week, Eileen. Michelle, thanks for the info and link. The flowers are beautiful, the birds are adorable and the barn door is cute. Happy 4th to you Eileen. Pretty birds. I love the daylilies and the clematises. Happy 4th of July! Beautiful blooms. The lilies are blooming here to now. So pretty. Love the flowers and tyne birds, Eileen! Eileen, those birds are wonderful. Scarlet Tanagers and Cedar Waxwings are an amazing combination. 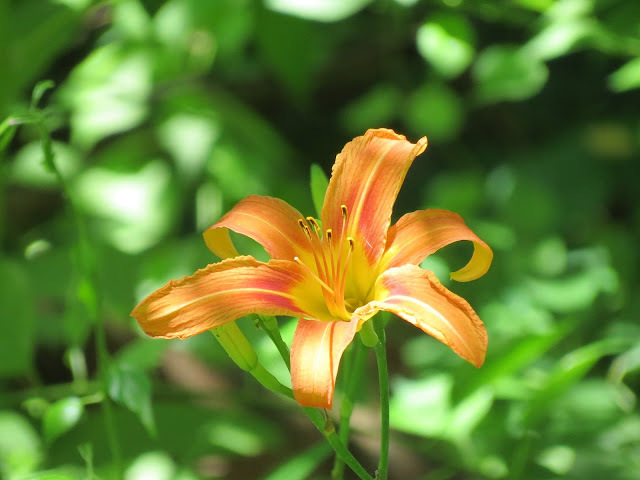 Question about the day lily: I always call them tiger lilies. Is that wrong? Hello, they have various names. I did a google search, they are also called Tiger Lilies, Ditch Lilies or Roadside lilies. Thanks for the comment and visit. Happy 4th of July! Enjoy your day and the new week ahead! Lovely lilies and clematis; so pretty little birds, as well! A wonderful day and a great week ahead! Very nice ! 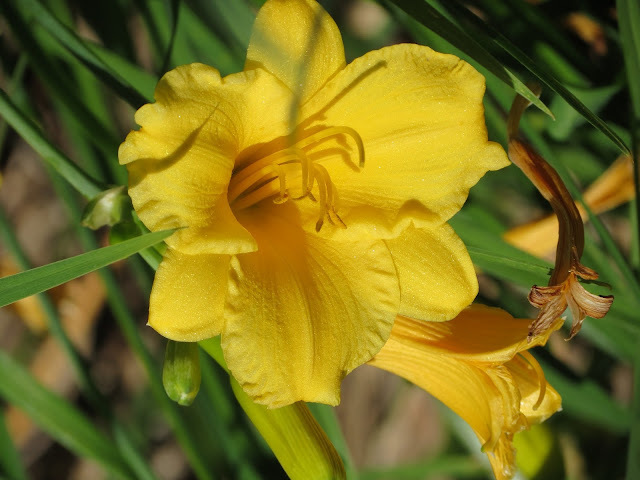 I love the daylily ! All your flowers are so beautiful and very colourful! What do you celebrate on the 4th of July? Anyway I wish you all a happy day on July 4! Hello, July 4th is the USA's Independence Day. Beautiful birds and flowers. Summertime over your way looks lovely! Your birds - Your blooms - Your barn, all make for a lovely post. These are lovely shots of nature. Happy 4th of July! Beautiful birds and blooms with a barn thrown in for good measure! Happy 4th. 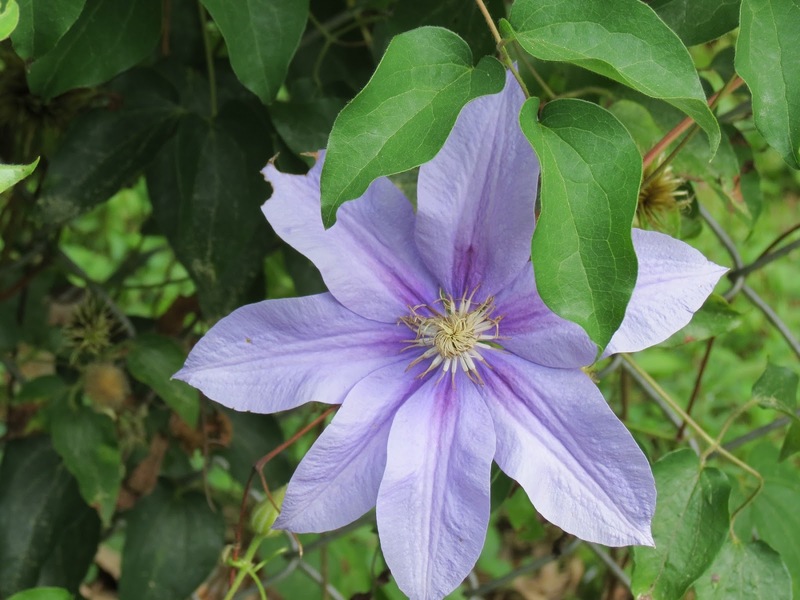 I love the clematis. Is that your yard? Such a shame to have lost your tree. Your backyard looks absolutely beautiful! Beautiful pics of birds and blooms! Thanks, Lynne! Have a happy day! Beautiful birds and flowers. They are all shinning in the summer. I am joining Seasons through your post. I hope you have a happy day. Hope you had a happy 4th of July, Eileen! Sorry, was today out of reach of the computer. Many thanks for for being a part of SEASONS! 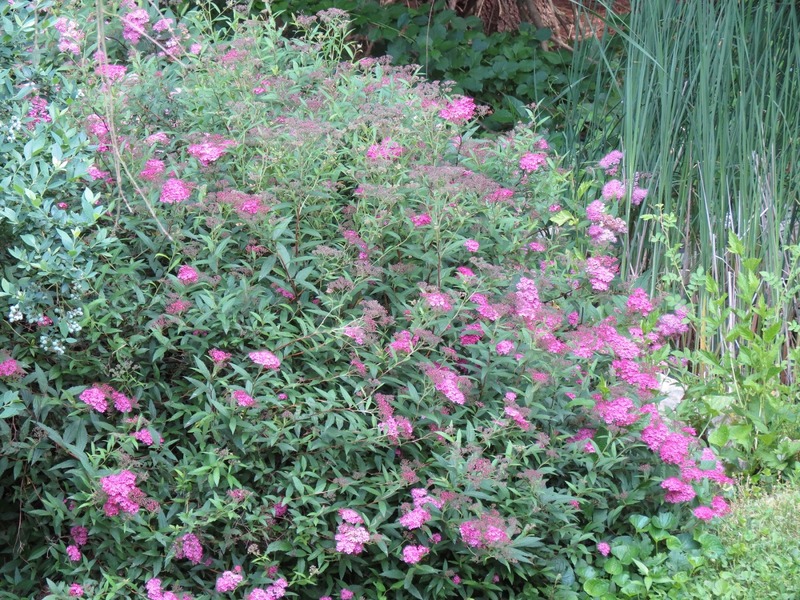 I didn't know a spirea bush could become that large (we once planted a little fledgling, but then moved to the STATES). Have a great week, and "see" you very soon! Sorry to hear that your Cherry tree has died. We don't have a darn tree in our yard! Sad, I know! Love the picture of the Scarlet Tanager--awesome! And I just assumed Carolina Wren, but no stripe... I am still learning! Catbirds left us--now I know where they went! Thanks for sharing your garden flowers--they are all quite beautiful! Hugs! hi eileen, so sorry to hear about your tree. did it go down in one of our recent storms?? beautiful birds and blooms, does Clematis come back each year?? i have an arbor in my backyard with climbing roses around it, that aren't doing well. i was thinking about taking those out and planting Clematis, it seems it would be easy to train it around the arbor. it seems to flower beautifully!!! i would love to see a Scarlet Tanagers, i don't get them in my yard and i don't see them anywhere in the area!!! You sure have an interesting range of backyard birds. It must be a real joy to look out and see what just arrived. Boa tarde, conjunto de boa fotos, as da natureza são fantásticas. Very beautiful birds and flowers reflecting true colours of nature. What a beautiful garden to be shared with your birds Eileen....hoping you had a wonderful Fourth! Beautiful blooms Eileen! Hope you had a wonderful holiday! Jealous on your Scarlet Tanager. For some reason, this bird does not want to pose for me:) Great birds for your backyard! I love all three - the birds, the flowers and the barn. Hope you had a Great 4th as well. I love those purple flowers! Hope you have had a great 4th of July! I enjoyed looking at your lovely garden and birds, Eileen. Hope you had a happy 4th. Sua árvore cerejeira morreu ? muito agradecida por compartilhar suas lindas flores! Amo mirtilo, aqui são caríssimos! Very pretty birds and flowers! Gorgeous birds and blooms, as always Eileen! Perhaps I have already commented, but I shall again because I am always in awe of your beautiful bird photos. Deseo que hayas pasado y un buen 4 de julio Eileen 🙋 La fiesta nacional hay que celebrarla bien. Hi Eileen, I too, like Spirea. We had it in our lake-front yard in TN. Beautiful pictures of the birds. Have a super day tomorrow! 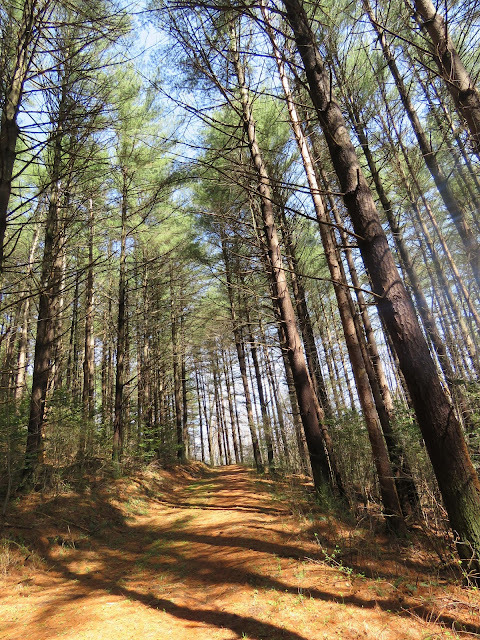 Beautiful captures of the trail. The birds are so cute! Oh, dear, it says you have turned off comments. But I'm going to try, anyway. I envy you your beautiful birds, Eileen, but am sorry you lost your weeping cherry. I lost one tree last winter, and one of my bushes is close to gone, but I am not a gardener such as you. Sinto muito pela cerejeira, mas as fotos, como sempre, estão belíssimas. I DO hope your July 4th was a wonderful one with your family. Such lovely flowers in your garden! I would almost be tempted to leave that cherry tree for the birds, but I suppose it is dangerous. (I haven't gardened or done yard work for so many years now that I've forgotten everything.) Wonderful birds as always and the lilies are beautiful.